Almost 200 kilometers of flat roads precede the final climb to Prato Nevoso on stage 18. The long approach across the Po Valley and the Langhe region leads to Mondovì, where the road starts the final climb of nearly 14 kilometers, on uncomplicated, very consistent grades that never go above eight percent. 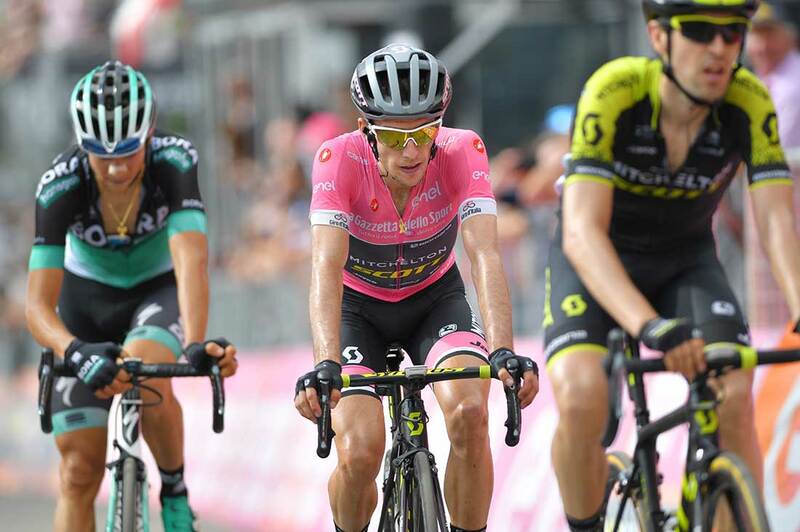 For the first time in this Giro d’Italia, overall leader Simon Yates (Mitchelton-Scott) showed signs of weakness, losing half of his lead — 28 seconds — to defending champion Tom Dumoulin (Sunweb) on the summit finish in Prato Nevoso Thursday. Chris Froome (Sky) and Domenico Pozzovivo (Bahrain-Merida) joined Dumoulin on the raid, shoring up their fourth- and third-place GC spots, respectively. Up the road, after 18 days of this Giro, a breakaway stayed clear to the finish, and Quick-Step’s Maximilian Schachmann took the win, his first in a grand tour. Ruben Plaza (Israel Cycling Academy) finished second on the category 1 summit finish after battling up to the eventual winner and Mattia Cattaneo (Androni-Sidermec), who finished the 196km race in third. Schachmann rode clear from the day’s 12-rider breakaway at the base of the day’s 13.9km finish climb. The 24-year-old almost missed the break, but he bridged across at the last minute with Michael Morkov (Katusha-Alpecin) before the escape got its 10-plus-minute lead. With the climb approaching, Boy van Poppel (Trek-Segafredo) went early. He was soon caught, opening the door for Schachmann’s attack. Cattaneo followed, content to sit in Schachmann’s slipstream on the gradual pitches of the climb that averaged 6.9 percent. Plaza yo-yoed off the back of this duo, as did Bora-Hansgrohe’s Christoph Pfingsten. With a couple kilometers remaining, Cattaneo and Schachmann tested each other with attacks. However, with the red kite looming at one kilometer to go, the duo slowed up and began playing cat-and-mouse games. This gave Plaza an opportunity to ride back to the front. Schachmann opened up the sprint, and Cattaneo cracked. Grasping the drops, Plaza put everything he had into the sprint. Though he couldn’t stay with the German winner, he secured second place after battling back to the leaders. Behind, the GC hopefuls lit the fireworks midway up the climb. For starters, Victor Carapaz (Movistar) and Miguel Angel Lopez (Astana) traded blows, vying for the best young rider’s white jersey. Lopez got the upper hand, riding away, and crucially he was followed by Sky’s Wout Poels. Dumoulin probed the bunch with an attack that was quickly marked by Yates. Then, Froome set off on a sortie of his own, and Pozzovivo responded immediately, followed by Dumoulin. Yates couldn’t reply, and the move soon reached Poels, who helped set the pace for his leader Froome. There was one hiccup around the final right-hand switchback as Poels went straight, missing the turn. Fortunately, the other three stayed on course and lost minimal time. In the end, they took 28 seconds out of Yates. Despite that, the pink jersey seemed chipper after the stage. With a 28-second lead in hand, Yates will aim to defend his lead in the high mountains Friday as stage 19 takes on the Cima Coppi, the Giro’s highest mountain pass, which this year is the Colle delle Finestre. The Finestre comes halfway through a 184km day that culminates with a summit finish at Bardonecchia.